you will be way ahead of your kitchen game if you add this one to your make often list. Do not be surprised if you are elevated to Top Chef in your household. Do not be surprised if family members, boyfriends, or guests beg you to make it again and again. It is just-that-good! Note:The original recipe calls for you to use boneless skinless breasts, prepared by pounding into cutlets, seasoned with salt and pepper and sauteed. I prefer to use bone-in breasts and the roast in the oven method taken from Ina Gartin. It is easier and so much more flavorful. Preheat the oven to 375 degrees F. Place the chicken breasts on a sheet pan and rub them with olive oil. Sprinkle generously with salt and pepper. Roast for 35 to 40 minutes, or until cooked through. I sometimes complete this part of the recipe up to one day ahead, wrap the breasts in foil and refrigerate. This method is so good for flavorful, moist roasted chicken that I use it for numerous recipes. You can save time and money by roasting more breasts than you need and freezing some for later use. sauce down until it is thick enough to coat the back of a wooden spoon (about 10 minutes). 3 Stir sage into sauce, adjust seasoning to taste with salt and pepper. Plate and spoon sauce over chicken to serve. Serve alone (for low carb version) or with rice, mashed potatoes, or pasta (use gluten-free for gluten-free version). Garnish with chopped fresh parsley. This sounds incredible! 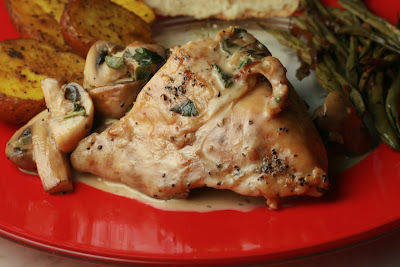 Mushrooms and sage are so good together, and the sauce for chicken looks great. It's going on the list! We can never have enough of chicken recipes and Im copying this recipe to make for this week!Looks delish!